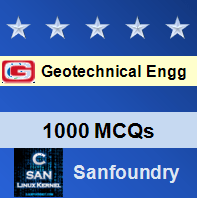 This set of Geotechnical Engineering Multiple Choice Questions & Answers (MCQs) focuses on “Well sinking”. Explanation: If water is present in the river, suitable cofferdams are constructed around the site of the well and islands are made. 2. To avoid the setting of the cutting edge unevenly, ___________ can be introduced. Explanation: It is desirable to insert wooden sleepers below the cutting edge at regular intervals so as to distribute the load and avoid setting of the cutting edge unevenly during concreting. Explanation: The inside shuttering of the well curb is generally made of brick masonry built to proper profile and plastered and the outer shuttering is made by wood or steel. Explanation: Excavation and scooping out of the soil inside the well can be done by sending down workers inside the well till the depth of water inside becomes about 1 m.
5. When the well is sunk deeper, the skin friction is decreased by which of the following method? Explanation: To overcome the increased skin friction and the loss of weight due to buoyancy when the well is sunk deeper, additional load known as kentledge is applied on the well. Explanation: When the dredging is done unequally tilts and cannot be rectified if the well is sunk to a greater depth. 7. The radius of the well curb should be kept _________ larger than the outside radius of well steining. Explanation: As a precaution to avoid tilts and shifts, the radius of curb should be kept 2 to 4 cm larger than the outside radius of well steining. 8. To counter act the tilts in the well during sinking operations, which of the following measures can be used? Explanation: Any of the following measures can usefully be employed to counteract the tilts in the well during sinking operations: i) regulating of grabbing ii) water jetting iii) eccentric loading iv) pulling the well vi) pushing by jacks. 9. In which of the following methods, hydraulic jack is used to counter attack the tilt in the well? Explanation: In pushing by jack method, the well may be pushed by force applied by hydraulic or mechanical jack on the tilted side of the wall. Explanation: Strutting the well method is used to avoid any further increase in the tilt of the well rather than rectifying it.